Chelsea midfielder Cesc Fabregas has reportedly been fancied to reunite with ex-Arsenal teammate Thierry Henry at AS Monaco where he is presently the head coach. Fabregas has endured a tough 2018/19 season with the Blues and he has managed just one league start under the guidance of manager Maurizio Sarri. Amidst this, there has been plenty of speculation regarding his future with his contract expiring in six months' time and Goal.com claims that Monaco could pounce on his services this month. Fabregas, who has also been linked with AC Milan, is free to discuss a pre-contract with an overseas club but the Blues may consider selling him this month to recoup transfer funds for a future purchase. Meanwhile, Monaco have encountered a difficult campaign in Ligue 1 this term and they are currently fighting a relegation battle with four points the difference between them and safety. 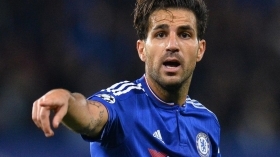 Fabregas recently featured from the bench for Chelsea during their frustrating goalless draw against Southampton. The stalemate sees them holding onto the final Champions League spot ahead of Arsenal with a three-point margin.